It was pretty thick in consistency but not to difficult to work with. It took two coats to achieve the opacity I wanted. I bought it at my local Target and they happened to have a sale on them so it was about $2.54 .They have this line at almost any drugstore so I would highly recommend checking these out: they're cheap and have a great color range and so far are pretty easy to apply. I think this color is perfect for summer time and would work great on the toes also. 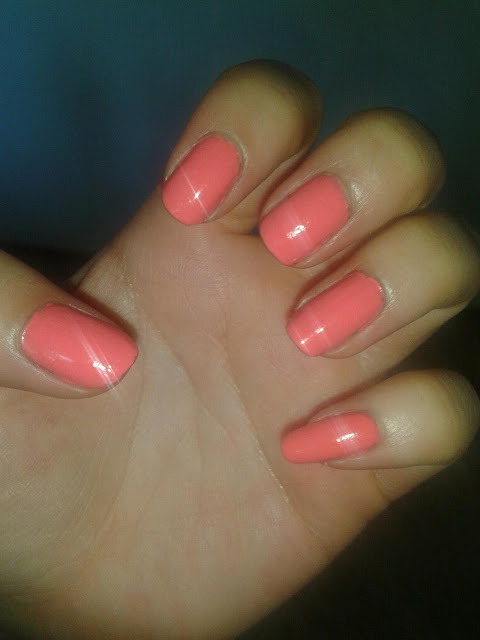 It truly is a vibrant coral color and what you see from the bottle is what transfers onto the nail, but more 'neon'. I highly recommend this color if you are into super bright colors. Here's a shot with flash to see if I could get more of the neon look into it. Not quite, but I like the effect the flash has on the nails making them sparkle like diamonds. >.< (I did use Sally Hansen's diamond top coat though too so that might be why it's extra shiny). I'm on day 3 of this nail polish and so far I have no chips at all. I just have a little wearing on a couple fingers at the top, but I think I could go a couple more days with this color.